When asked about my nationality, as a kid I would say “Hungarian, Cherokee and some Polish”. I have not been able to find the Cherokee as of the typing of this blog (and after years of looking). I do have a line that runs through the Melungeons which I am still trying to confirm. But I am fairly certain that is the closest I will come to “Cherokee”. It involves “Old Ned” Sizemore and is quite colorful. Hungarian is what I mostly identified as. And, although I loved my Grandfather dearly, it really is only one layer of my ancestry. His parents were “off the boat” immigrants. For that, I have official records, ship manifests and Hungarian military passport books. The Polish was through my birth father’s Dad. Grandpa’s Parents were born in Poland and came to the United States. I have the census records, death certificates and have requested a copy of their marriage license, hoping it becomes part of my official records. 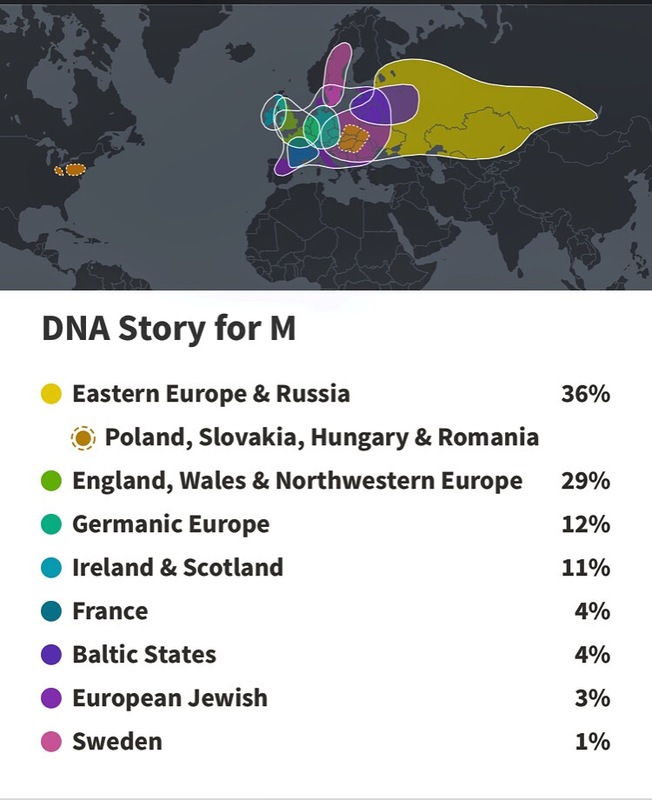 But by saying “Hungarian and Polish”, that really does not adequately convey my ancestry. It leaves out the lines that continue through my Grandmothers. Those lines travel through Ireland, Scotland, Switzerland, England and Germany. The women have more complicated lines. My birth father’s Mom has a line that ties into that of Martin Luther. I am slowly piecing that together and am amazed at my findings. Her other line links directly to Scotland. I hope to make my way to Grandfather Mountain one year for the Highland Games and to hear the calling of the clans. Ma’s Mom had roots so deep in Tennessee it was almost impossible to find when they first came to the area. But eventually I located the two Moneyhun (Monaghan) brothers who first made their way from Ireland to settle in the United States. Then there is the random 3% European Jewish. I have zero clue where that comes from. I have found ties in areas that confirm all of the splits noted in the above list. But not the European Jewish. I hope to find that one day. It is on my Genealogy Bucket List. There are so many twists and curves in my research. I have loved every piece of it. Even the mysteries! Did you have a DNA test? Were you surprised by your results? I would love to hear about it! Let me know in the comments below.